Lefton China Pitcher and Bowl SL-764-2 I believe this is green heritage though the background appears more yellow, to me. 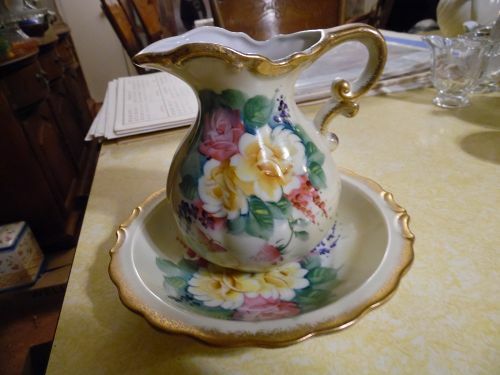 Excellent Condition, No cracks or chips, No crazing Pink and Yellow Rose Pattern with lots of gold trim. Pitcher approx. 5 1/2" across without handle Bowl approx. 7 1/4" across. 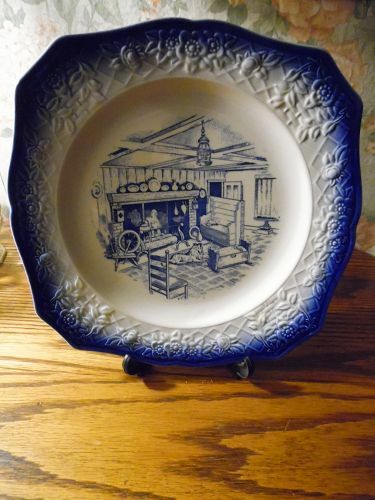 Dolores pattern restaurant dish stamped O.P. 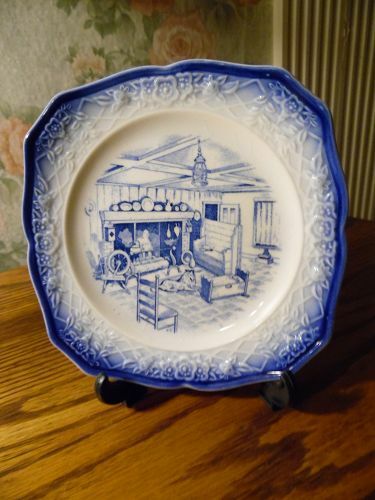 Co Syracuse China Date code 3-J. Perfect condition and measures 2 1/4" tall and is sorta oval shape 2 1/8" by 3 1/4". 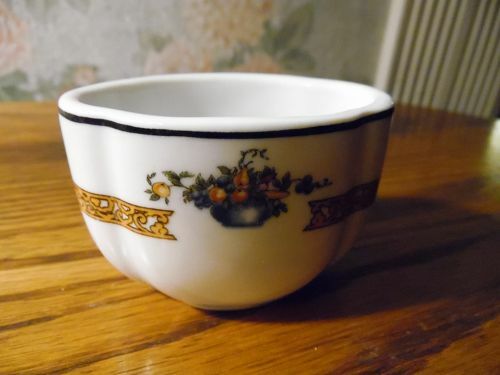 Black bowl of fruit and sprays with fancy gold filigree band and blue edge trim. This may have been for crackers or other condiments on the table. Perfect condition. 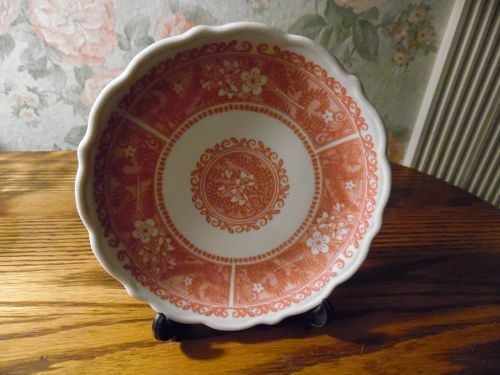 Syracuse Restaurant Ware Strawberry Hill bread and butter plate 6 1/2"
RESTAURANT WARE by SYRACUSE CHINA Corporation USA Strawberry Hill bread and butter plate. Pretty red on white pattern. Measures 6 1/2" diameter. Very good used condition - No chips, cracks, crazing,scratches, stains or fading. 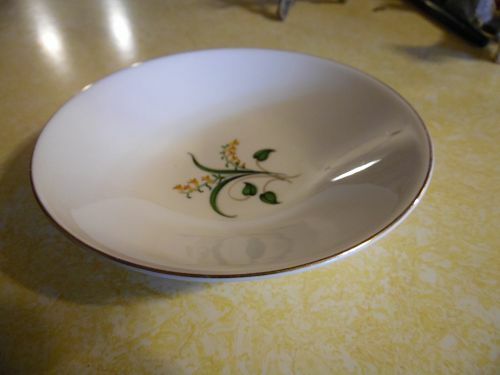 Edwin Knowles Forsythia pattern 7 3/4" soup bowl. Gold trim, coup shape. Excellent condition. I have 2 available. Price is for 1 bowl. I will be listing several pieces in this pattern if you need to add to your set. I will combine shipping if you need multiple pieces. 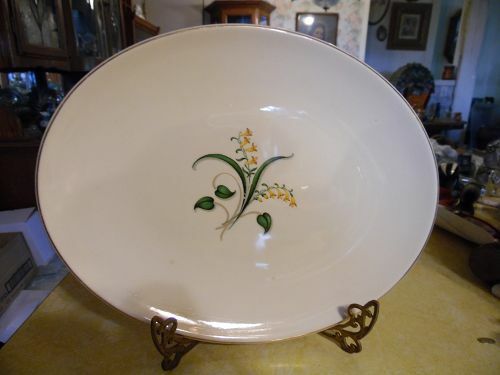 Edwin Knowles Forsythia pattern 5 5/8" dessert bowl. Gold trim, coup shape. Excellent condition. I have 6 available. Price is for 1 bowl. I will be listing several pieces in this pattern if you need to add to your set. I will combine shipping if you need multiple pieces. 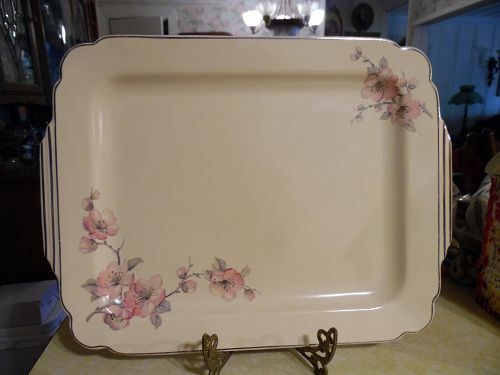 Edwin Knowles Forsythia pattern 12 3/4" x 10" oval serving platter. Gold trim, coup shape. Excellent condition. I will be listing several pieces in this pattern if you need to add to your set. I will combine shipping if you need multiple pieces. 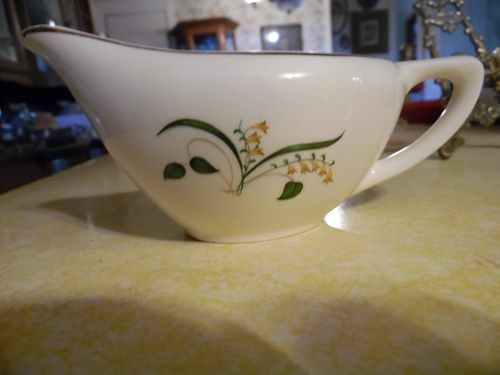 Edwin Knowles Forsythia pattern creamer. Gold trim, coup shape. Excellent condition. I will be listing several pieces in this pattern if you need to add to your set. I will combine shipping if you need multiple pieces. 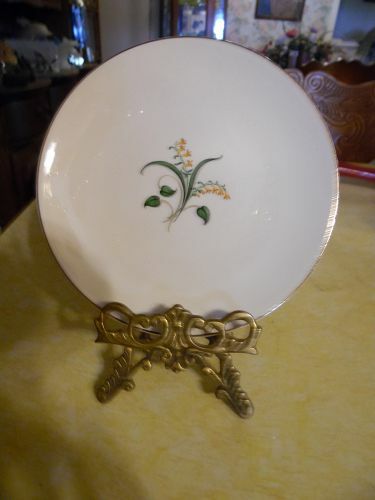 Edwin Knowles Forsythia pattern 6 1/4" bread and butter plate. Gold trim, coup shape. Excellent condition. I have 6 available. Price is for 1 plate. I will be listing several pieces in this pattern if you need to add to your set. I will combine shipping if you need multiple pieces. 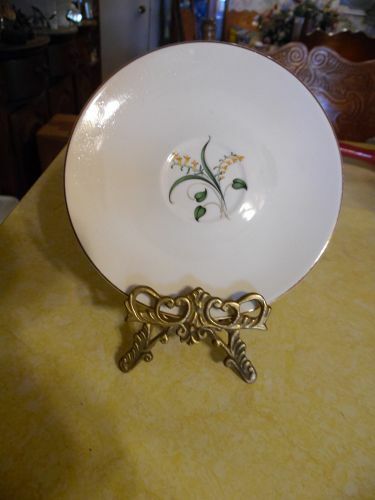 Knowles Forsythia pattern single saucer NO CUP. Gold trim, coup shape. Excellent condition. I have 3 singles available. Price is for 1 saucer. I will be listing several pieces in this pattern if you need to add to your set. 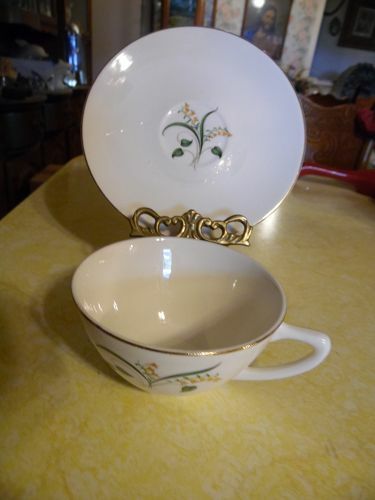 Knowles Forsythia pattern cup and saucer Gold trim, coup shape. Excellent condition. I have 3 sets available. Price is for 1 cup with its matching saucer. I will be listing several pieces in this pattern if you need to add to your set. 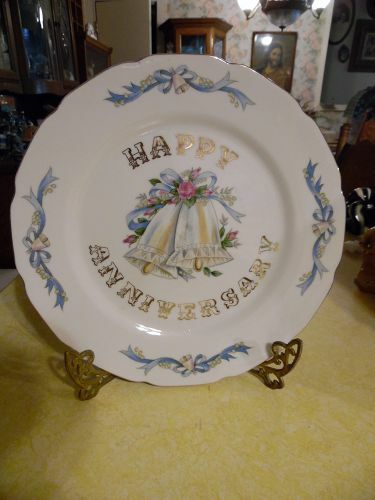 "HAPPY ANNIVERSARY" 10-1/4" Display Plate. Beautiful wedding bells, and Gold Trim Detail Can be used for any anniversary Excellent condition, soft Colors, Lefton Mark # 5509. 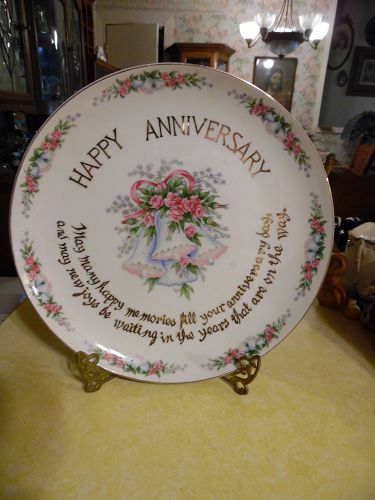 "HAPPY ANNIVERSARY" Huge 12 1/2" Display Plate. Beautiful Roses and Gold Trim Detail With GOLD Writing Blessing. "May many happy memories fill your anniversary day and may new joys be waiting in the years that are on the way" Can be used for any anniversary. Excellent condition, Bold Colors, number 5430 stamped in gold on the back. Possibly Lefton or Norcrest. Quality. Wells China Homer Laughlin pattern C-84 Century shape platter 15 1/4"
Antique platter measures 15 1/4" x 11 1/4" Century shape, Other pieces to this set have the Wells peacock mark (Homer Laughlin) this has no mark. 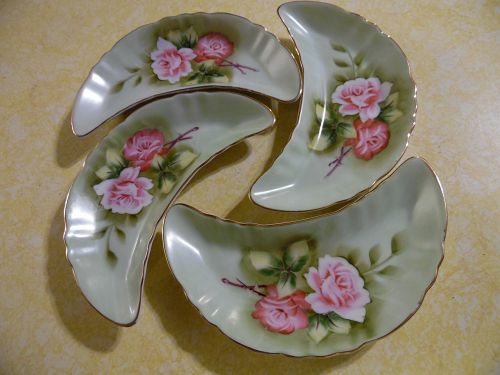 Pink Flowers, Gold Trim with tab handles. Gold is very good 98%-100% .Very nice condition all over. No damages. I believe this is the largest platter in this pattern. See other pieces I will be listing to this set. 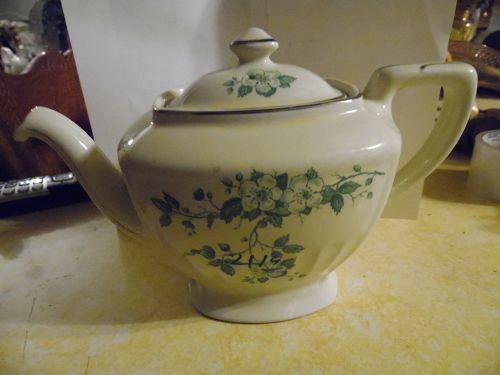 Made by Salem China USA in the century shape. This pattern is called Godey Prints and came with different color borders. 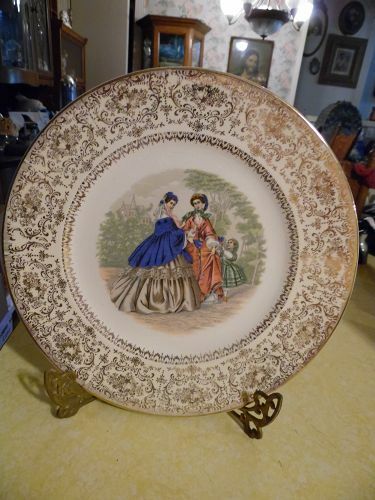 THis one has a white border with lots of lacy gold filigree accenting on the border. Central pattern is two Godey girls and a little girl in period costume. 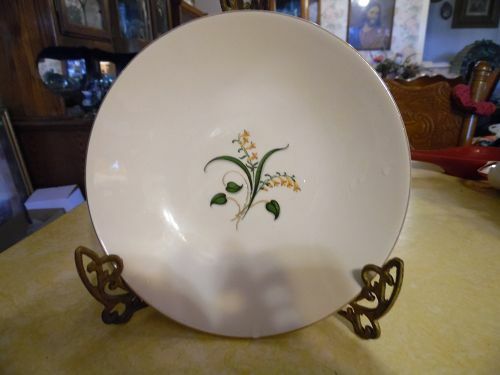 Plate is considered a charger measuring 10 3/4" and has no chips or cracks. I just have 1 available. But I do have another listed of the Godey Girls wit a colored border.